Surgery in the early 19th century was still a crude business. Surgeons were mostly trained through apprenticeship, and no standardised or accredited system existed to examine them. 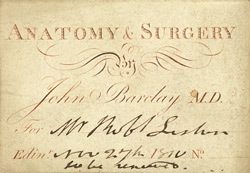 As a result, leading doctors like John Barclay began to set up anatomy schools. Such doctors had small museums with wet and dry specimens for their students to study, and they gave lectures demonstrating their ideas and theories. Public executions provided the only legitimate cadavers for dissection and students would watch dissections in public theatres along with fascinated members of the public.